"Monsieur Morris" is an important cat of nobility and is also known as "king of the neighborhood". 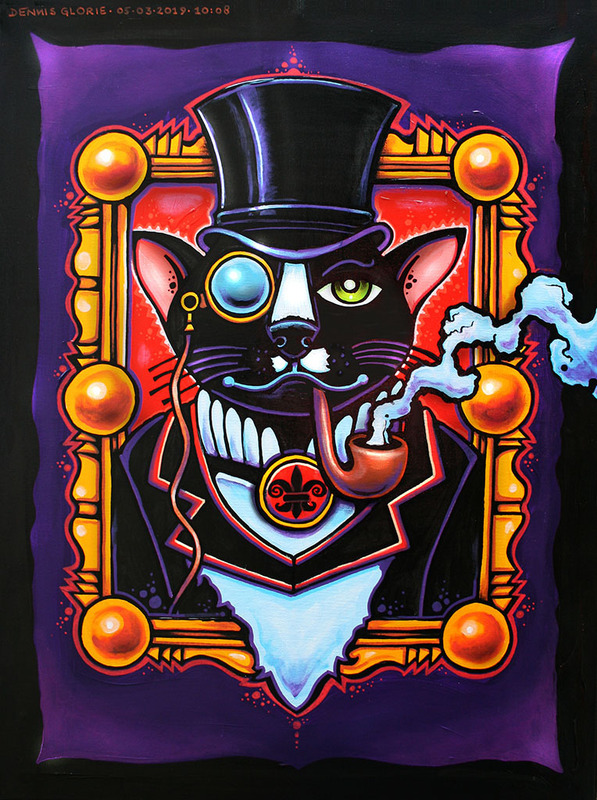 The mission was to create a painting of Morris, to perform it in "Steam Punk" style and to add an aristocratic feel to it. Morris has a top head, is dressed in a stylish jacket and a posh monocle had to be part of this creation. In addition, Mr. Morris is wearing a medaillon on which the "Fleur de lis" symbol is depicted. The symbol of purity and the royal bloodline. This work of art is called "Tree of Love!". Like every year, Dennis makes a special painting for his son’s birthday. Congratulations on your 14th birthday! The fantasy tree has several roots that are firmly anchored in the earth, the symbol of endurance and strength. 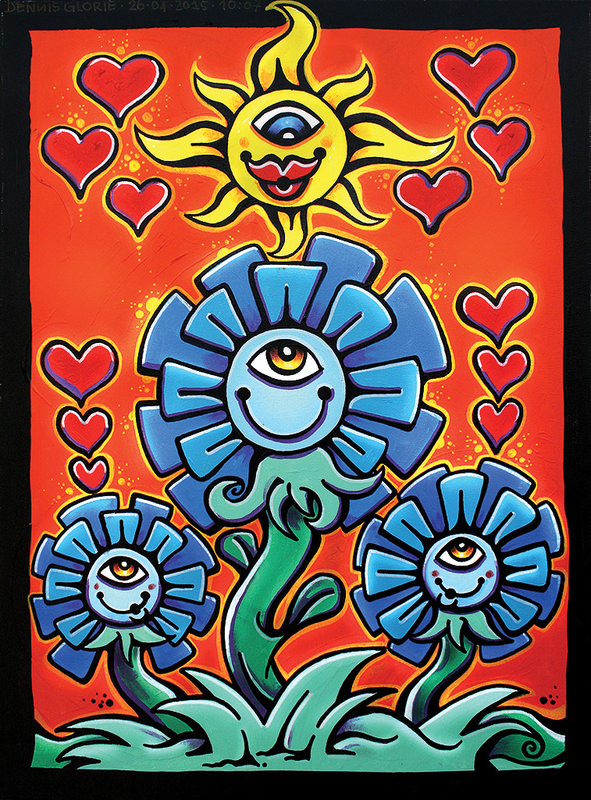 The core of the flower consists of four red hearts that symbolize love, with a waking all-seeing eye in the middle. At the core of the trunk is the heart of the fantasy tree depicted, it is encircled with a rainbow aura, the symbol of hope. The "Dennis Glorie Sun" is also present again. This painting is bears the name "To Know What You Were Built For...". It’s a about a mystery, the big "What is life" question. That concludes, where do we come from and what is our purpose. One thing is for certain, love is the message. This painting is called "Joachim & Boaz". The work revolves around a higher state of awareness, which is depicted in symbols and metaphors by various mystic societies. Long ago there was Sumer and its Sumerian civilization with its famous clay tablets that have remained preserved. A highly developed civilization with among others laws, mathematics, astrology and astronomy, of course, knowledge of the elements. On the clay tablets is next to all sized planets "the origin of man," as we know it now appears. The "Anunaki" or "those who came from the stars" were their gods. According to the translation Anunaki crossed their DNA with ours. Dennis has portrayed this in his own style, a Sumerian epic of the well-known biblical Adam and Eve. Dennis also talks about the "all-seeing eye in the triangle" which he says stands for "divine" .If I’ve noticed the stairs that from the spaceship comes down and I say this, he explains it immediately, because it is a "DNA string ".The Anunaki came to earth with the purpose to find a" working breed". After DNA tinkering, so "we" arose. Then they left and let "us" behind. Said a smiling Dennis. This painting represents the Sumerian story of the creation of man. The painting "Bloody Mary" was created for a good friend, a fashion designer who already owns and purchased several works of art. 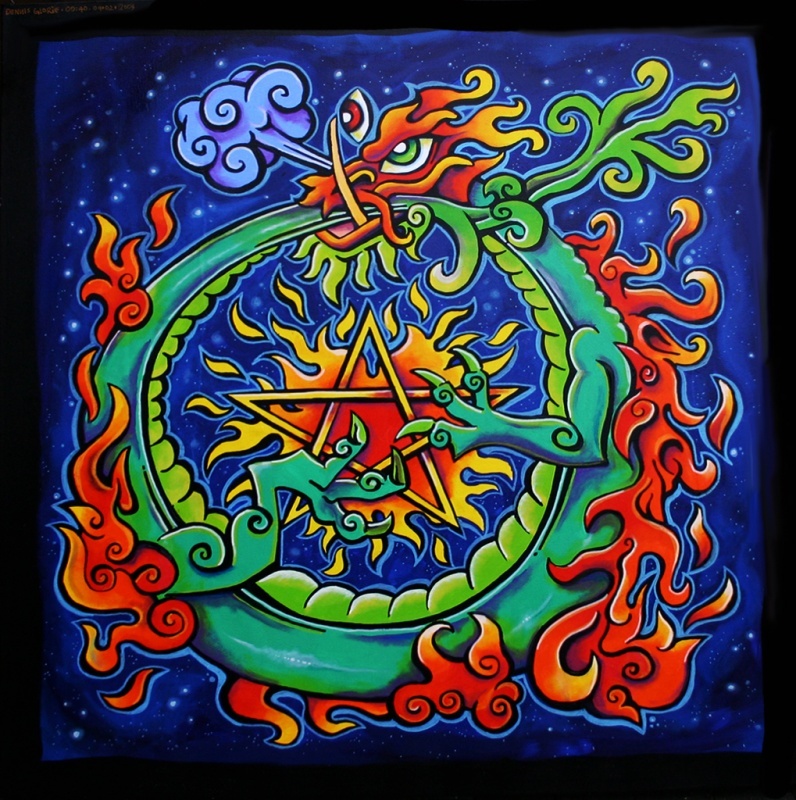 "Ouroboros" literally translated from Greek meaning "the tail devourer". Or a snake or dragon chasing its own tail and biting in it. It is a mythological figure which represents the reaching of the highest spiritual and mental potency in a human being. In mysticism it is known that the DNA of a person than "opens up". 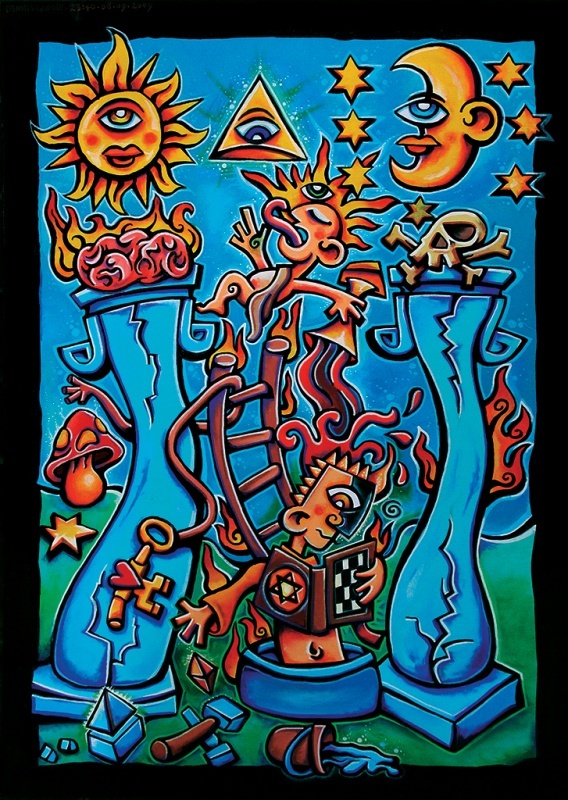 Dennis, fascinated by the symbolism of the mystical world, decides to paint in the center of the painting a flaming pentagram depicting off course with "point upwards" which has a positive charge. This particular combination symbolizes the conscious awakened man. Walking into the studio of Dennis Glorie, he approaches me with a smile and he leads me to his latest work. Upon seeing the painting just completed my gaze falls directly to the popping colour yellow in the flames around the guitar pictured on the left. The most important element in the fabric of his client. This was a special and complex assignment where the past and present of the life of his client to be displayed on canvas. Performed in the typical, recognizable painting style of Dennis Glorie. In the center of the canvas depicts the principal Ronald. Around the figure are elements that defined his life and still determine, in short, music, electronics and technology. On the monitor, we see different symbols and elements. 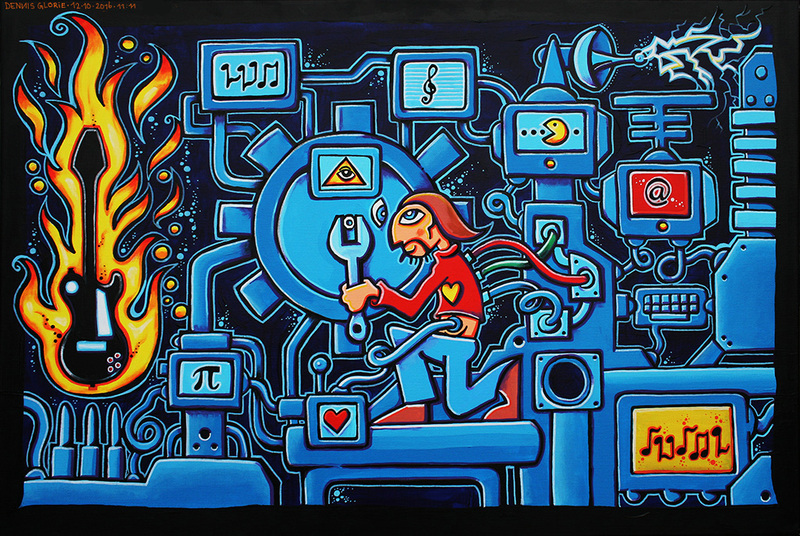 Likewise, I notice a monitor with the Pi symbol, which is coupled in the painting at the heart of "the Ronald figure". Dennis then says that the value of Pi is also the name of the artwork; "Roon-Bot: 3.141592653". Now I understand the name that this painting carries. The colours speak for themselves and the whole looks very detailed, tight and powerful. 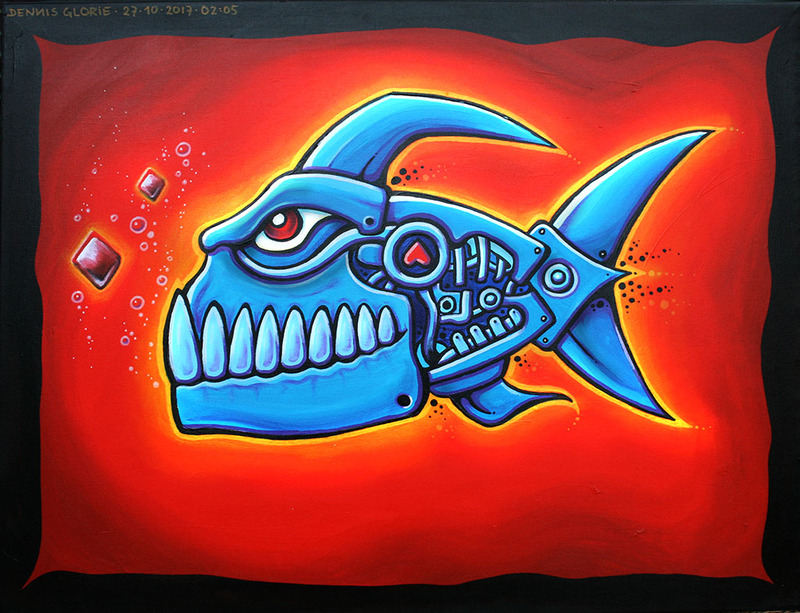 "Piranha Power" was specially commissioned for Marcel. 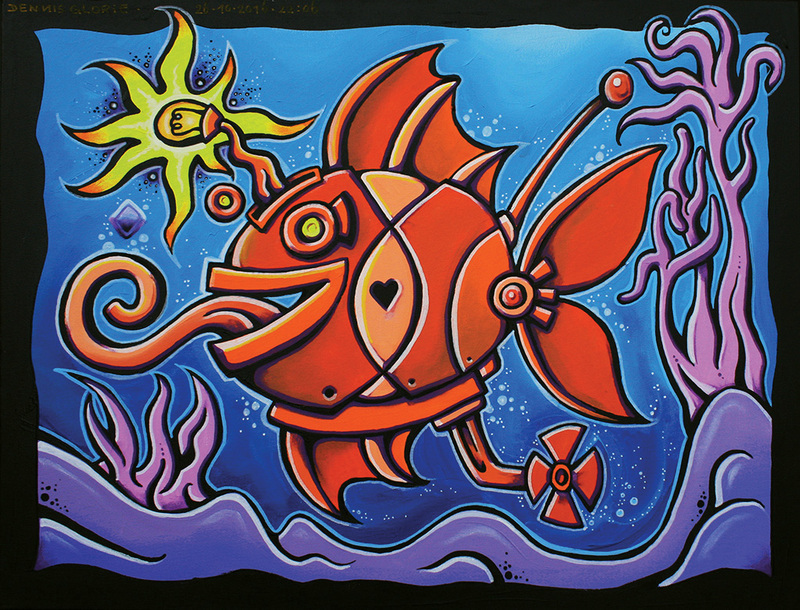 The painting shows a cold blue-colored metal piranha robotic fish on a warm red background. This color combination ensures a high contrast. In addition to some round air bubbles, the Piranha breathes two diamond shapes. This diamond shape is also known as the "octahedron" in the ancient occult world. The symbol of air. The red heart of the Piranha is mirrored, which has a counter meaning of the symbol in the correct state. Elsewhere but close to me! How hard can life be? What can a person bear? When my time is come, we will meet again my little man. Every breath I take, every thought I have, I know you are always close to me. I miss you my "mini me", every single day. Spiritual enlightenment is the subject of "Stairway to Heaven". The piece of art was commissioned for a valued friend. It is always nice to get carte blanche when creating a painting. "Recognize The Pain in Me" was specially created for the Dutch "K.A.M. Foundation" (Art As Medicine Foundation) for the forthcoming exhibition at the children’s department at the MCA Hospital in Alkmaar, the Netherlands. "Jah is a Shield upon my Right and my Left Hand"
"Jah is a Shield upon my Right en my Left Hand" was specially created for the Dutch "K.A.M. Foundation" (Art As Medicine Foundation) for the forthcoming exhibition at the children’s department at the MCA Hospital in Alkmaar. The Rasta Philosophy of life remains a favorite subject. Love, unity and respect. Jah bless. Every year Dennis Glorie makes a painting on his son’ s birthday. The artwork is called "Roots are Forever!". A powerful fantasy flower, performed in bright colors, with roots that enter the dark earth into the night. Descendants remain descendants forever and ever. The concept of this artwork is the unconditional love of the father for the son. The fantasy flower with its roots presents the artist himself. The two side branches with each a heart symbolize his sons. I miss you, every single day. When showing the painting "Aquarius Android" Dennis appears frowning. Once again there is great symbolism to be found in the painting. Dennis has this painted in bright blue shades. What is striking is that there is a red eye and a red heart displayed, contrasting or complementary colors, they really pop out of the canvas. Incidentally, he says it’s a "robot fish", which "has been given a second chance" with the new air into his lungs .In it’s eye the "Yin Yang" symbol appears, the symbol of balance. Dennis points to the vertical lines around the heart symbol and says he has painted a vertical hidden "Vesica Pisces" , also known as a "Christ fish." 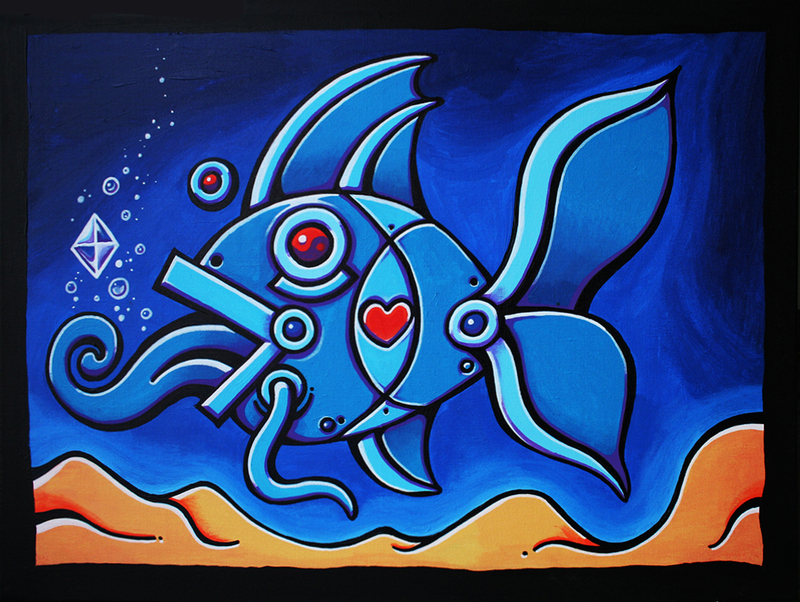 This symbol is also known in the mystical world as an "initiation" .Also the fish breathes a diamondshape. Dennis calls this a "octahedron" in the ancient alchemy symbol for air. According to him, this is one of the five "Platonic solids". It has to do with "Sacred Geometry". There began a period of depression, worry and sadness. Yet Dennis wanted a light point to keep in mind and for the birthday of his son, because of the eternal love of the father for his son. On the birthday of his son Dennis always makes a painting for him, which he, in spite of the happy day is a birthday, his sense of painting that dominates. Here he portrays how he felt on the day. We see instead of a sun a moon in the dark night sky. The figure Dennis presents is himself, there is a blue "wave" through his spirit, loss, pain and sorrow. The whole painting is in shades of blue. The only thing that has a different color, is the heart behind the bars is thereby blasts that element of the canvas. Dennis is proud to present at the workshop, his new painting and tells me right away that the cloth bears the name "Twisted Bird". I ask him about the idea behind the chosen name and where this new work is based on exactly. He does not want to go too deep into the meaning, but he explains that he recently had to deal with a very unpleasant experience. An experience in which someone appeared to be "two faced". It is also why these "fantasy bird" has two different faces. One love and one of hate. Dennis points out the figure with a happily smiling head and a second head with a nasty mouth with teeth and a forked tongue. On one side, the painting shows a dying flower with drooping heads and thorns on the stem. Next to that, I see a flourishing flower on the other side. What strikes me is that the "Dennis Sun" is not smiling, which is almost always the case. The style and use of color in this painting is again recognizable as a typical work of Dennis Glorie. 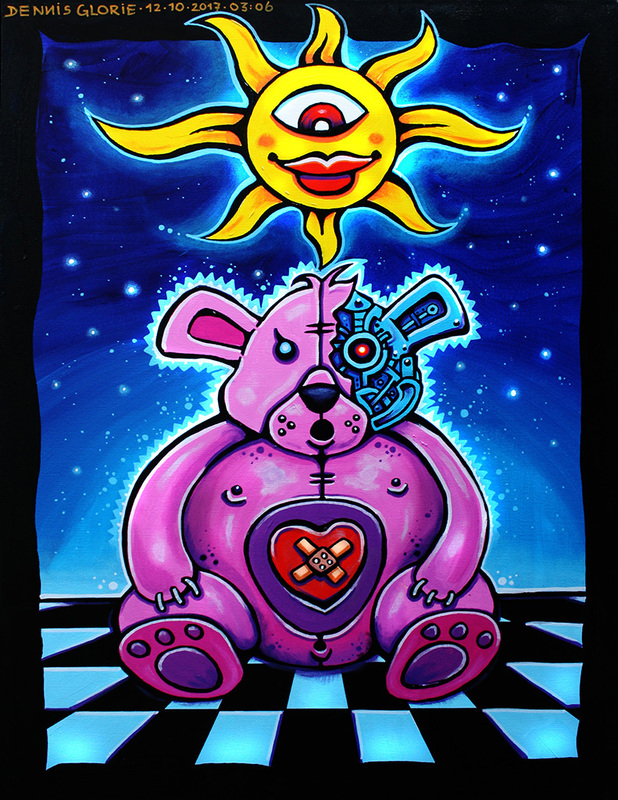 Dennis Glorie just finished this painting, it’s called "Impossible Love". Bright en fiery colors meets the eye. 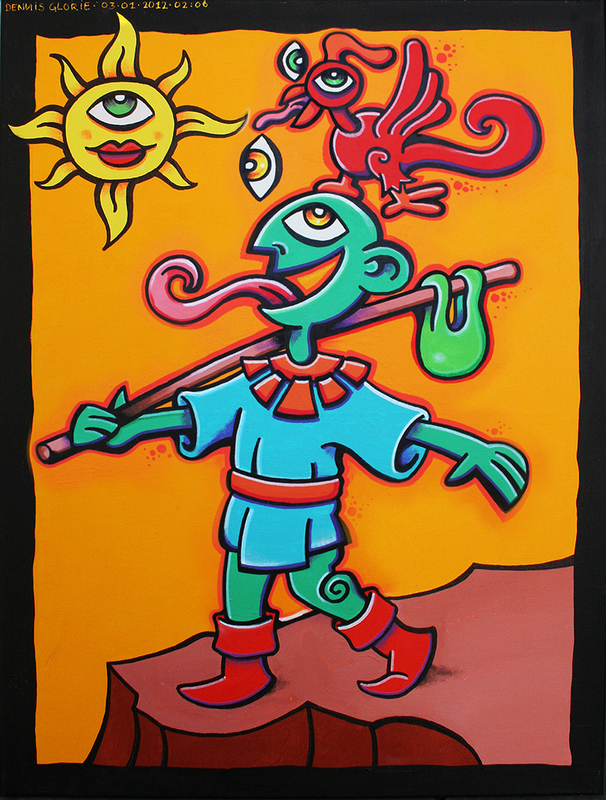 This painting is specially made for the children’s section in the hospital MCA. "Wicked Act" was specially created for the Dutch "K.A.M. Foundation" (Art As Medicine Foundation) for the forthcoming exhibition at the children’s department at the MCA Hospital in Alkmaar, from February till June 2018. This painting by Dennis Glorie is called "Metal Warfare". This name was chosen because Dennis has tried to bring the mechanical together with the mystical and is about duality and spiritual war. The painting is about enlightenment and duality. He explains to me that there is also some symbolism hidden in this piece of art. 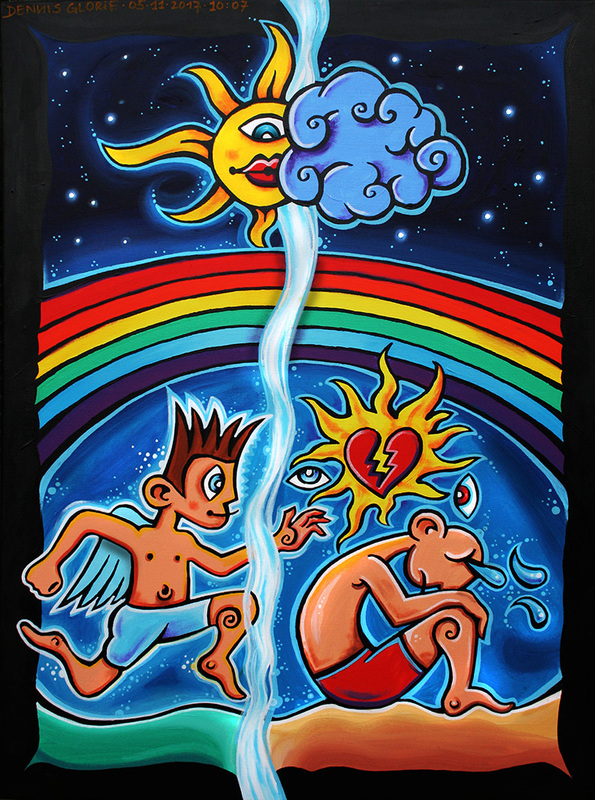 Dennis Glorie recently came up with the idea of creating a painting for the children’s department of the MCA Hospital in Alkmaar. There is an admission procedure and strict selection of art which is allowed to be presented in this place. The work must of course be colorful, powerful and most of all give a positive vibe. Dennis hopes, that when the work is selected, it will put a smile on the face of the children who are having a hard time over there. 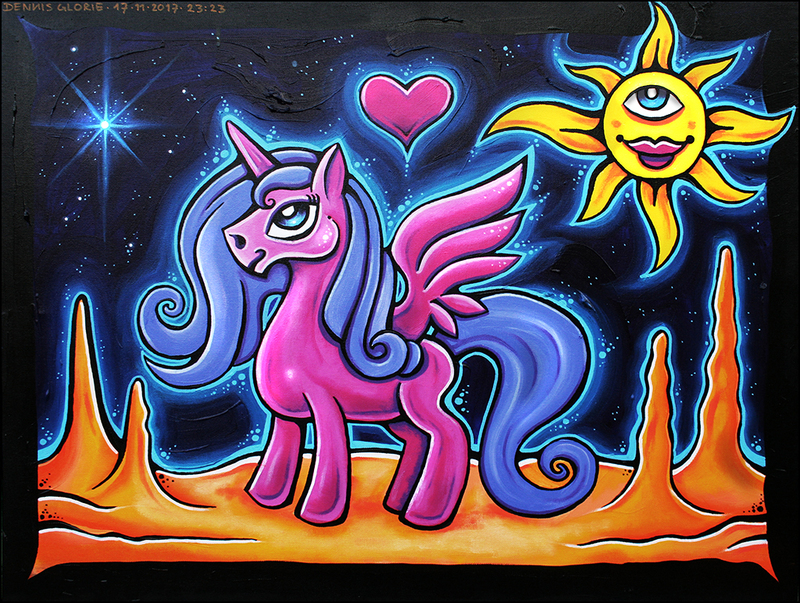 "Space Unicorn" was specially created for the Dutch "K.A.M. Foundation" (Art As Medicine Foundation) for the forthcoming exhibition at the children’s department at the MCA Hospital in Alkmaar. 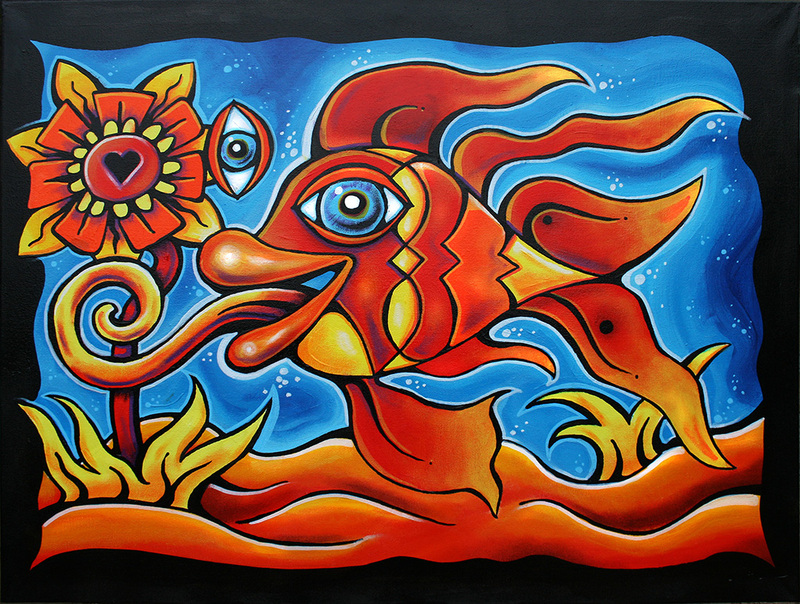 At the moment I walk into the studio of Dennis Glorie is a striking and colorful painting in his workshop is finished. The piece is called "Karma Cameleon". Recently, an art lover came to Dennis studio to buy a painting. 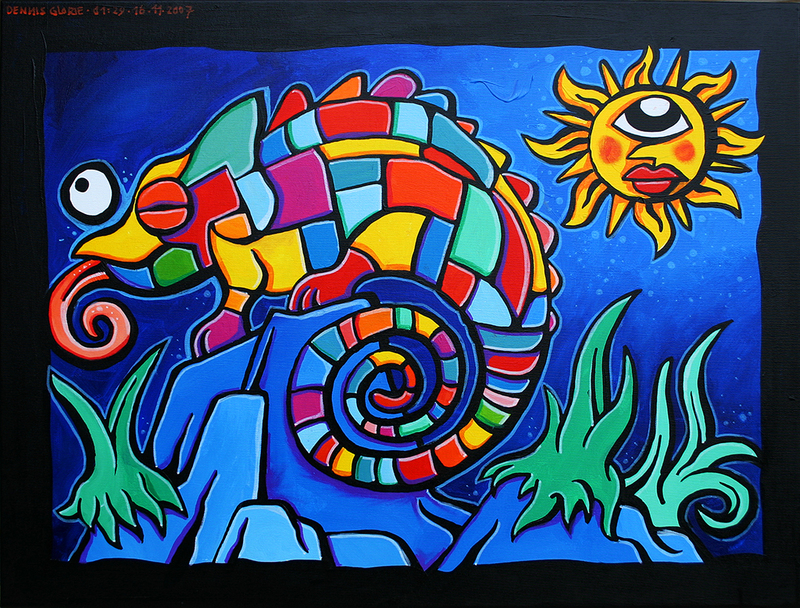 The artwork "Karma Cameleon" was preferred by the art collector . But Dennis would not sell the painting at this time. He has too many memories of the canvas. As Dennis explains that the fact was in the kitchen of his former home, and this work was also the favorite painting of his son. At the time, a man who claimed to be a sincere friend, a dishonorable and bad way attempted to steal the artwork of Dennis. The law triumphed and the work came back to Dennis. An ironic story, especially given the name of the painting. "One Love" was specially created for the Dutch "K.A.M. Foundation" (Art As Medicine Foundation) for the forthcoming exhibition at the children’s department at the MCA Hospital in Alkmaar, from February till June 2018. Love is only an word, but everyone knows the feeling. Love cannot be bought, it can only be given and sometimes it’s even unconditional. How wonderful it would be if all the people in the world were united. This was de dream of Robert Nesta Marley. 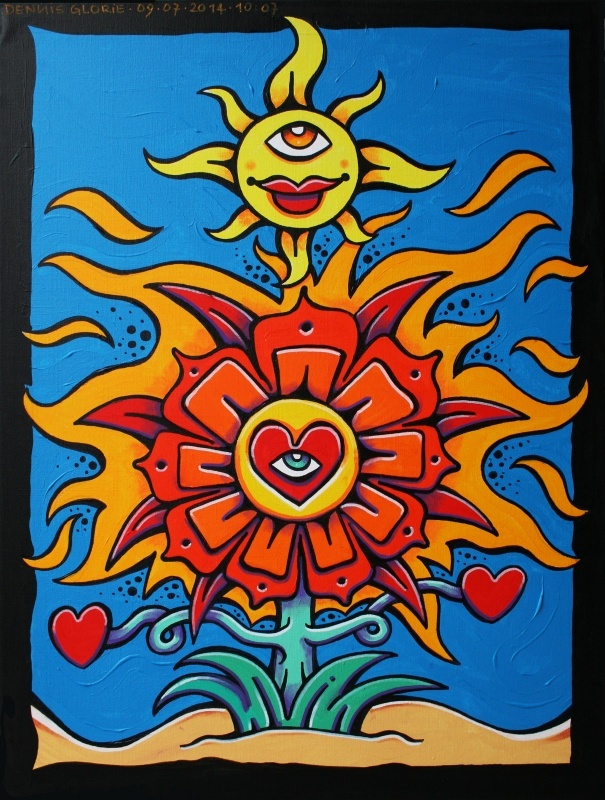 Inspired by the most famous song of Marley, I decided to choose "One Love" as a title for this painting. 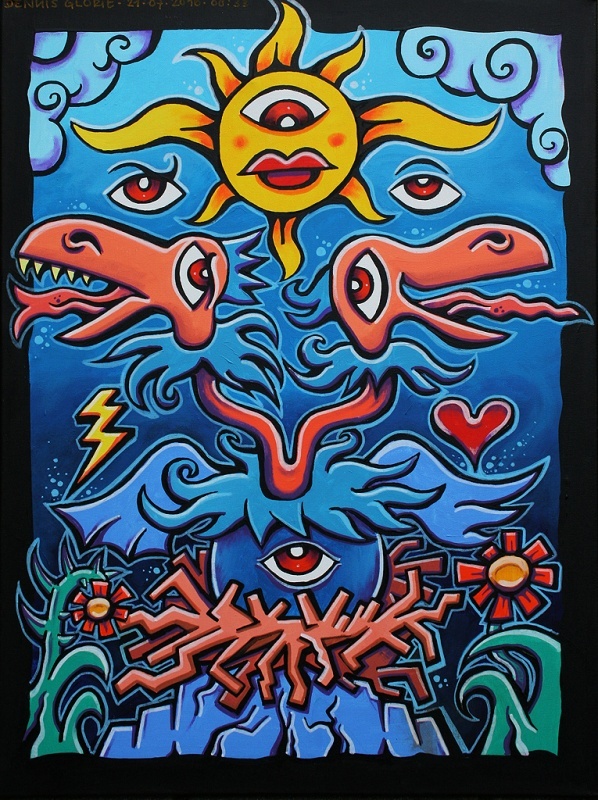 This painting is called "Tree of Duality". The whole is in pink and purple tones. The heart of the tree or flower is done in an octagon. As is known in sacral geometry, this form conducts energy and is therefore much applied in architecture. 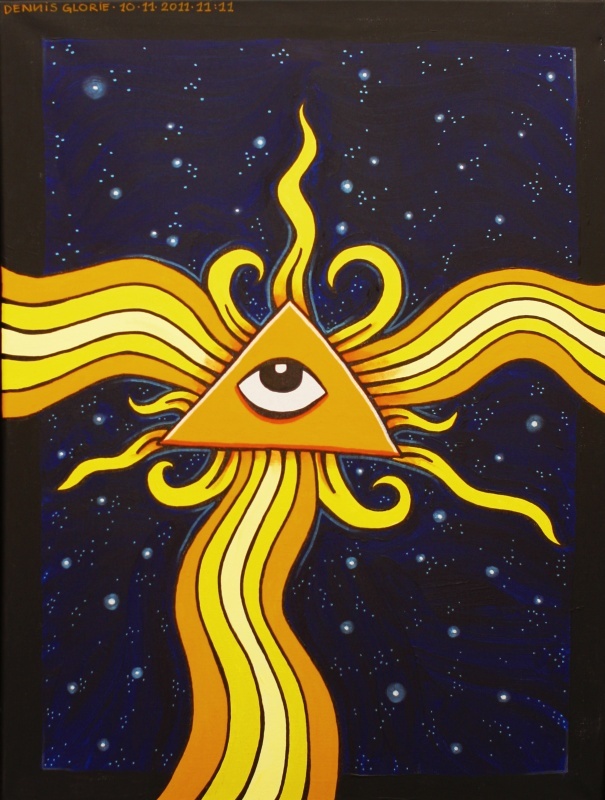 At the top of the painting we see the all seeing eye, or the divine. 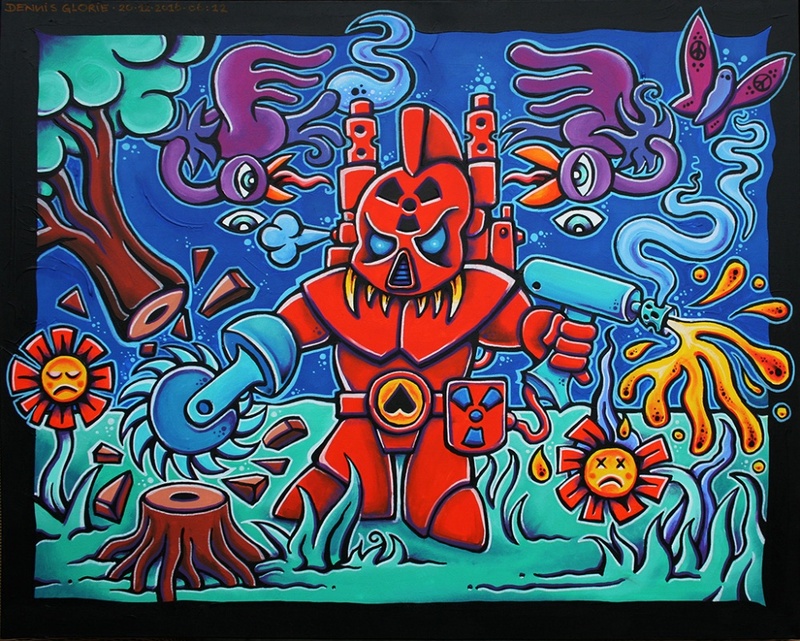 This painting by Dennis Glorie is called "The Antibiotics Beast". It was commissioned for a good friend who wishes to remain anonymous. The artist was asked to create a personal painting that included the life of the client. Soon came inspiration and Dennis recently completed this piece of art. 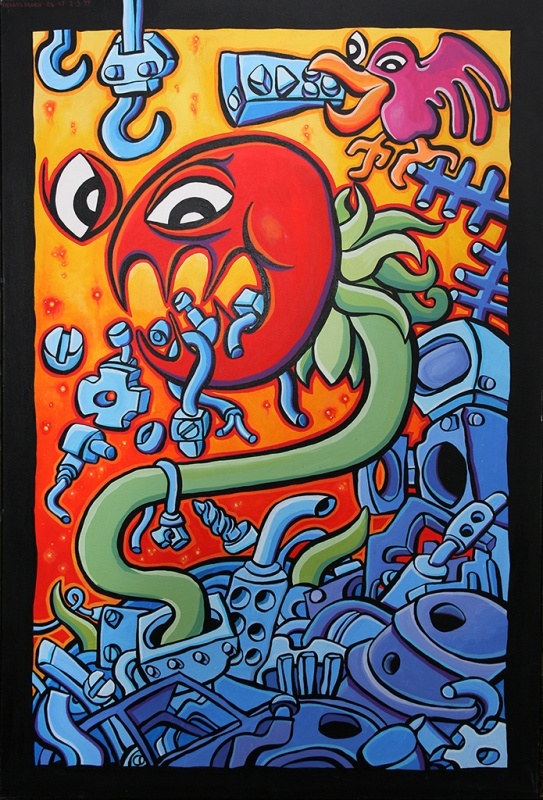 This painting is about the toxic poison "antibiotics" which most of the time is like a war against nature. Dennis Glorie has tried in this painting to illustrate the dangers of the use of this "drug". 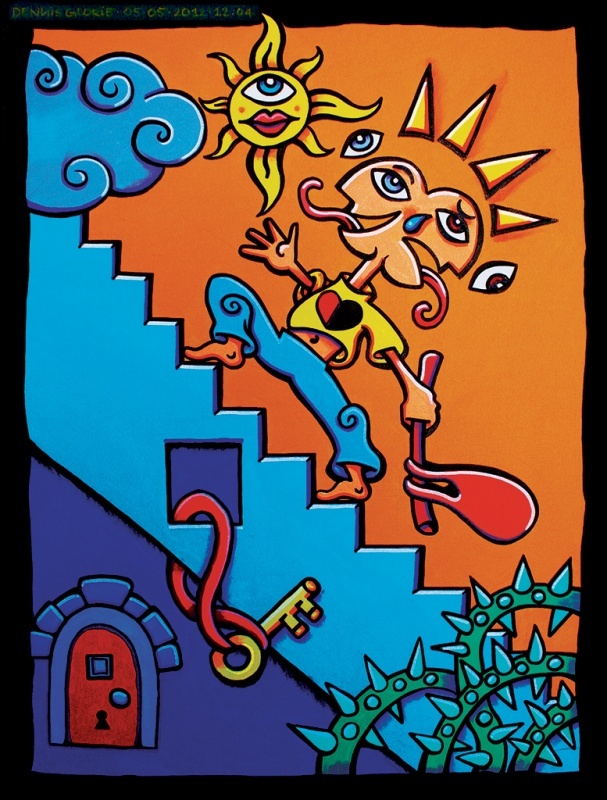 This artwork was created by Dennis in 1999 and is called " Hope Progress" . I ask him immediately the significance of this painting , as most of his works have a rationale. He also told this cloth should imagine that will eventually overcome the industry’s nature. For example, he points to the metal devouring plants and a bird playing with a remote control. The colors are bright and make this work for granted. Kamiel, a lover of the painting style of Dennis Glorie, recently posted a new contract, which has now been completed. After a pleasant evening brainstorming creative in the studio and busy making sketches of the concept for the new work, a new idea was born. As was the rough basis for this concept was already there. It was just a matter of designing and development of the final phase. 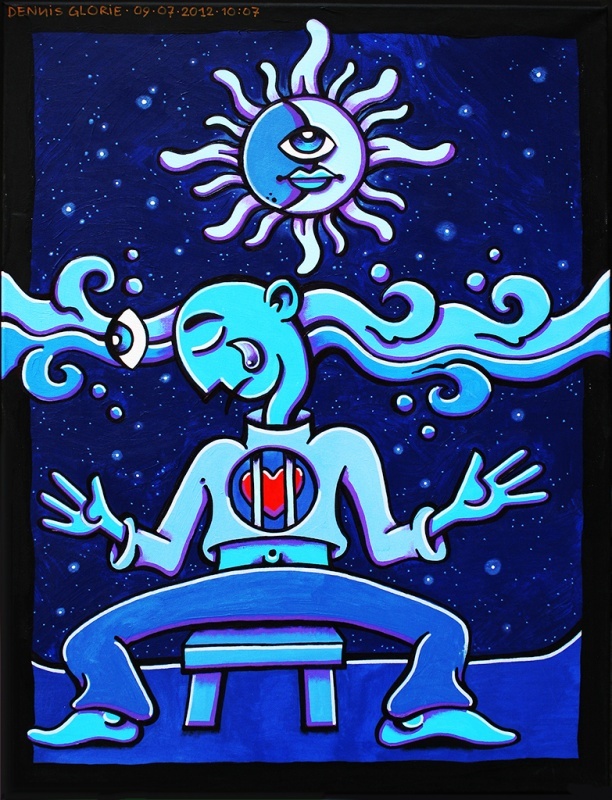 The painting refers to the "ego-death," the "Christ Consciousness" or the "Dark Night of the Soul" experience. We see the duality between good and evil. 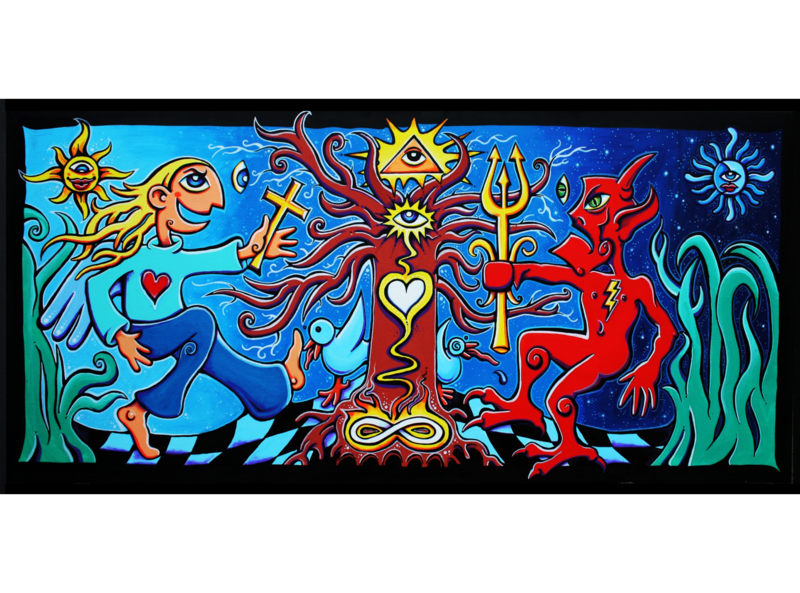 This is symbolically represented by the dance between an angel in battle with a demon on the "chessboard of duality." The mystical experience where the "kundalini energy" from the lemniscate in the roots of the tree of life eventually rising through the heart to the crown of the tree of life. Also, the "all-seeing eye" again present in this "procedure of enlightenment". Dennis Glorie has recently completed a new work of art. The painting is called "A Concrete Heart Can Hold No Love". 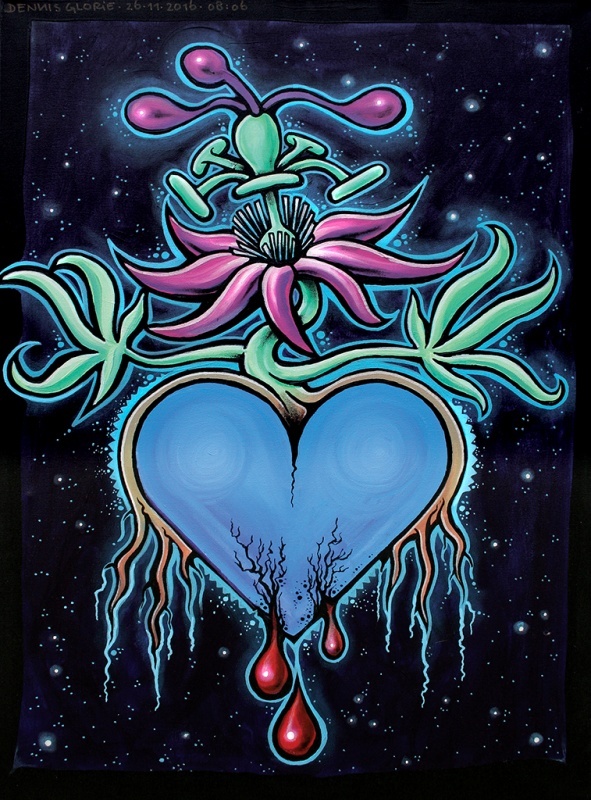 I see the symbolic "passionflower" with a heart shown in a background filled with stars. 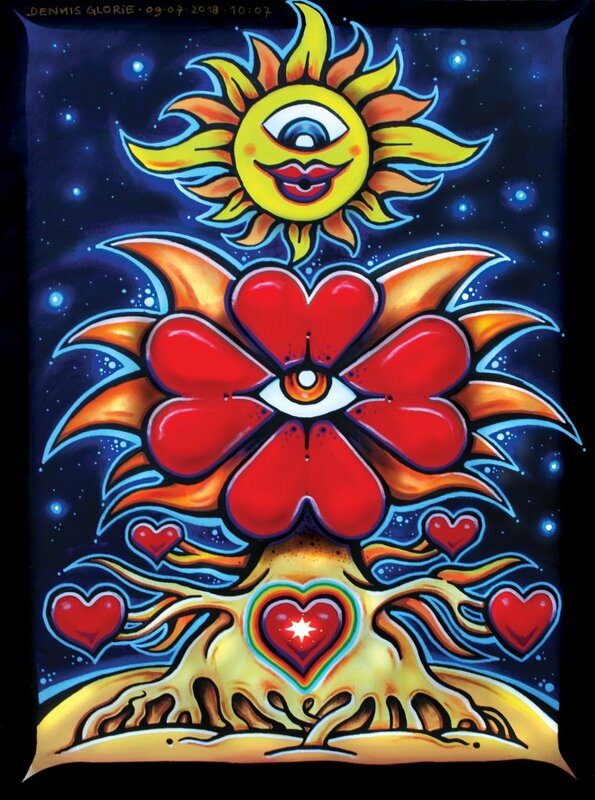 According to the artist, the flower is trying to penetrate the heart of stone. All in vain and the name of the painting says it all. 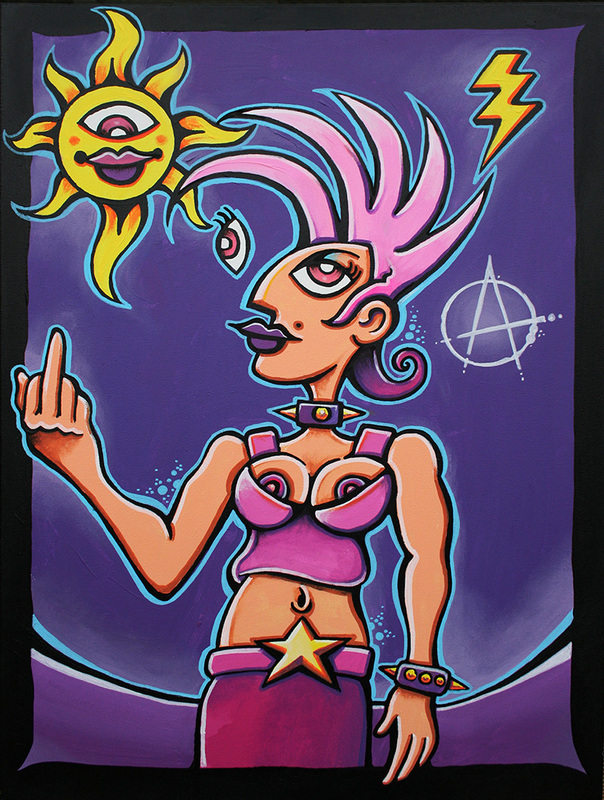 The painting "Pink Anarchy!" by Dennis Glorie is painted in response to a woman he met recently, she made him think of the pop artist "Pink". This lady is a pure rebel and wild at heart heart. She has a problem with authority and rules. This is also shown in the painting by the anarchy symbol on the right in the background. Kicking against the system, the perfect subject for the artist to create another piece of art. The Three of Us Forever! 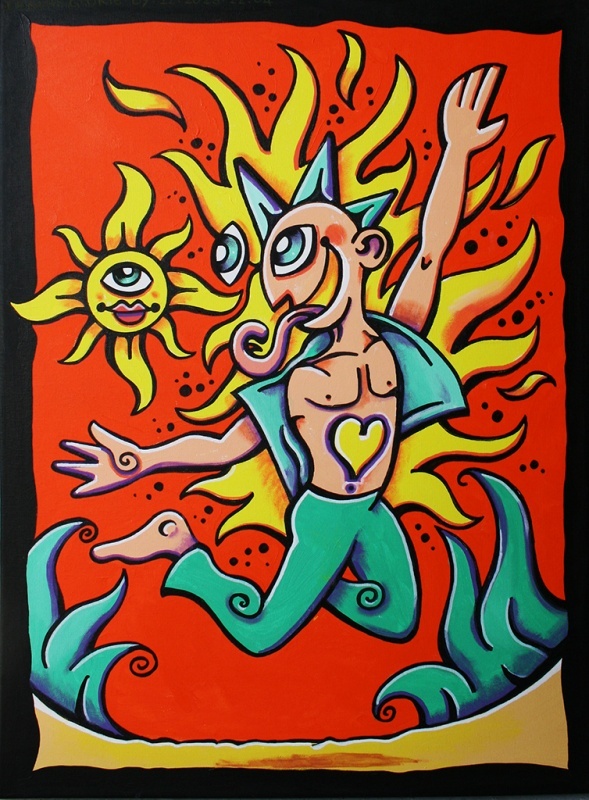 This painting created by Dennis to show his undying love for his two sons. 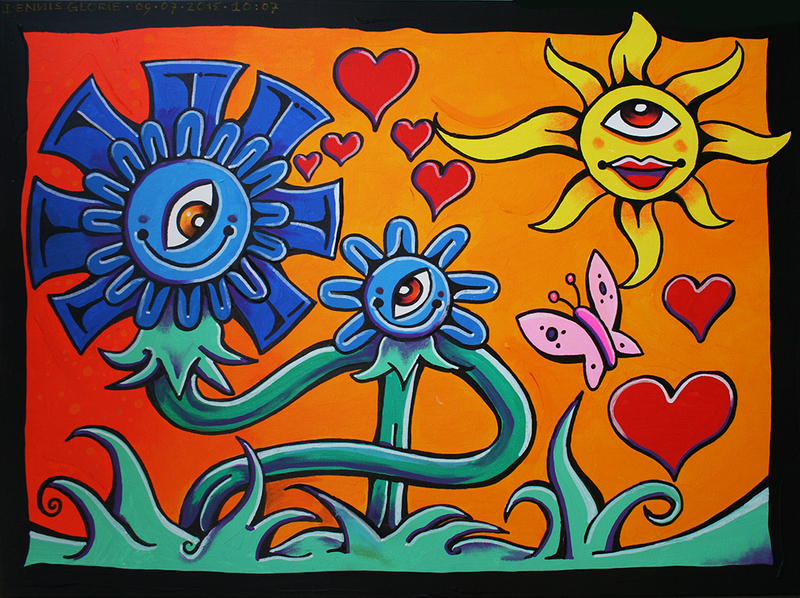 The big flower in the middle represents Dennis himself and on both sides he has represented a small flower, his two boys. 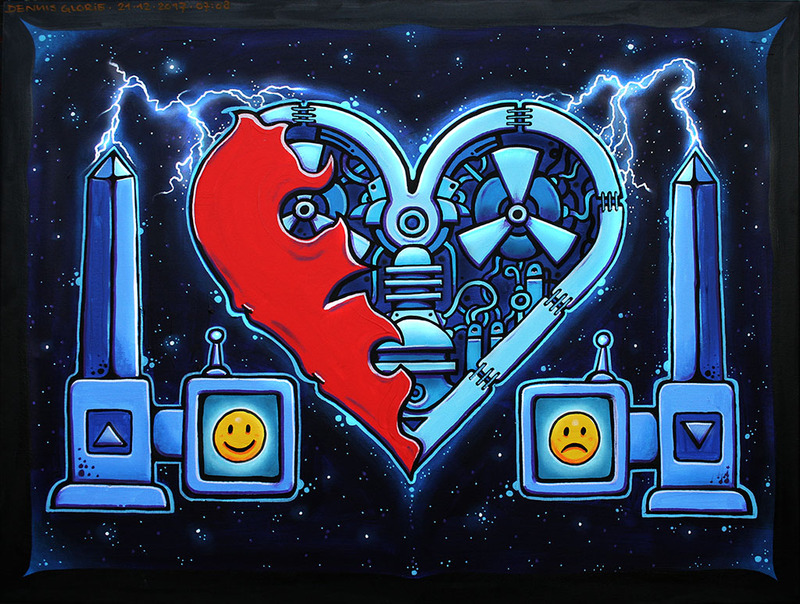 On the hard orange background contains many hearts painted. 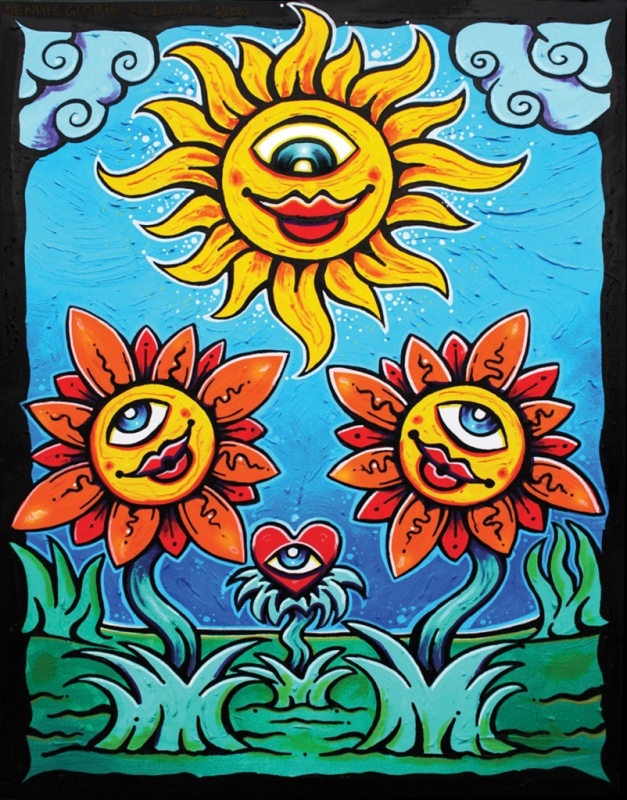 The "Dennis sun" takes part to the whole, smiling and looking down at the three. The small flowers are inextricably linked with the big flower, their father. The unconditional love that binds them forever, is expressed here. This painting was commissioned for Martijn, a good friend of Dennis. The work is called "Desire". It is painted in response to a particular spiritual process. He tried on the way he saw the experience at the time, to translate it into an image. I ask Dennis what the key is about and represents. He looks serious and says it has to do with cracking the code to access the heart. It sounds interesting, but also a little sad. Between male and female is love, nevertheless she is blind to the mystical. Whenever I Think of You! Natasja, a friend of Dennis, came along when he was engaged in a brainstorming session of a new concept for a painting. She found that he made a huge progress in his development and came up with the idea to paint a blossoming flower; the phase in which she saw Dennis. And so became the cloth, Dennis like a blooming flower of love with a rich fantasy cordially receives the sun’s rays. Nice detail: the two side branches with each a heart symbolize his children. 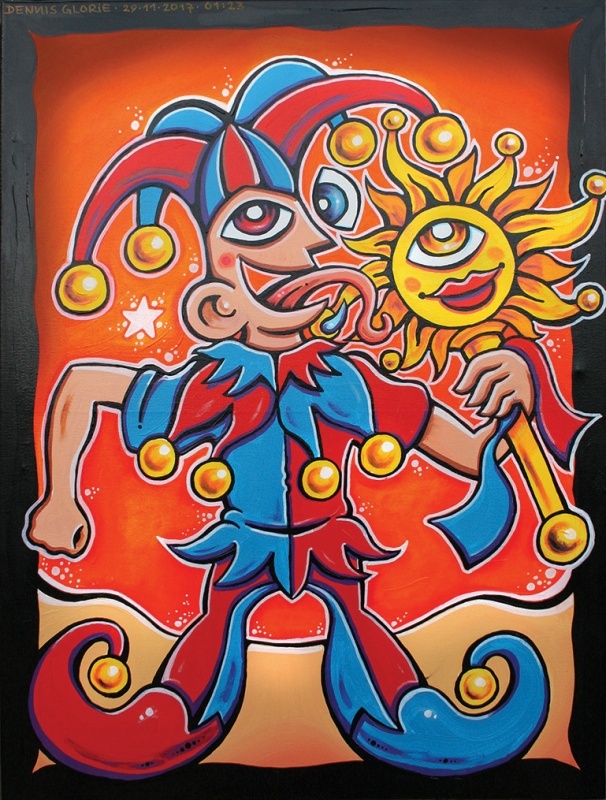 This painting is based on a specific card from the Tarot system, The Fool. For Dennis a nice topic to once again create a new painting. Thus the continuous inspiration comes from everywhere. This requirement is designed, executed in his own style of painting. The green figure is about to take a very important decision, but does not know where he goes, he stares at the sun, face the abyss. Dennis has his own twist to it and has a red bird depicted on the head of the figure, crazy? When Dennis was walking down the street came a familiar smell in his nose. A couple of guys smoking pot. Despite the memories and the love for Rasta and Reggae he was glad he himself had stopped at an early age with cannabis. He arrived in his studio and the events continued to keep him busy. Shortly thereafter Ton asked, a friend that came by whether Dennis again could make a painting of a robot. 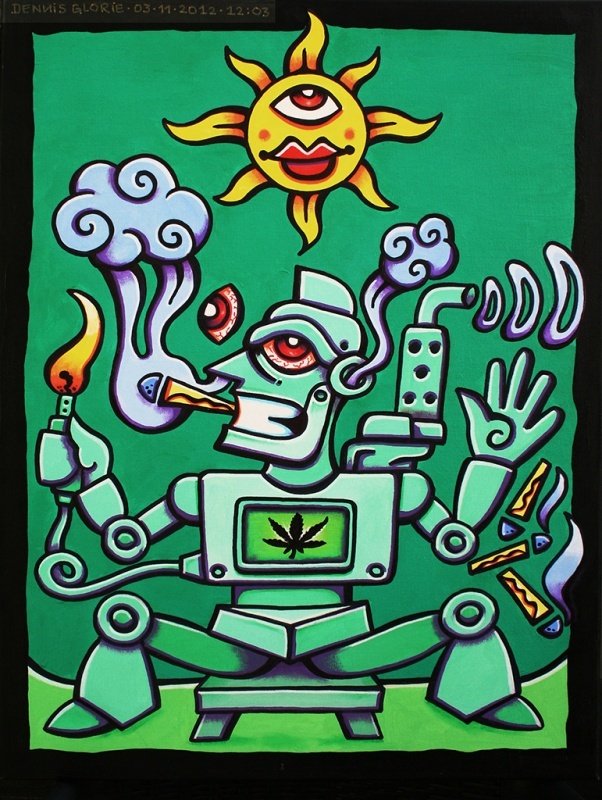 This combination brought Dennis on an idea, a robot who smokes. The property was developed in various shades of green. The eyes of the robot are in bloodshot red, a nice contrast to the green. Hence the name "Red Eye Robot". The "Dennis sun" is here again present. From his youth, Dennis was already interested in the Rasta culture with of course associated Reggae music. Lifestyle and thinking he has made his own. The moment we start talking about the interpretation of this painting is therefore again Bob Marley music playing, there is a quiet, relaxing atmosphere in his studio. I ask him what the painting is about. Dennis says he recently encountered an extraordinary man called Abdul. Abdul has dreadlocks and reminds him of a Rastaman, a beautiful subject for a canvas. 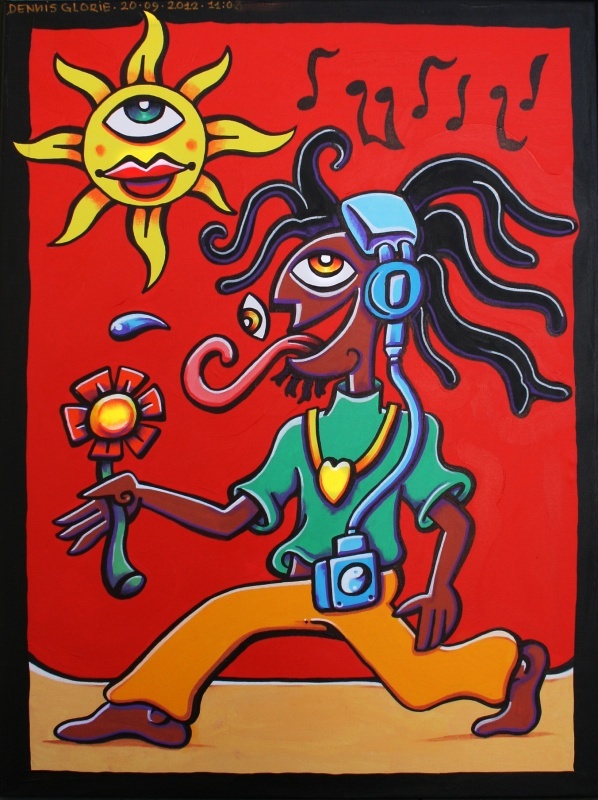 We see a Rastaman laughing holding a flower, listening to Reggae and dancing all through life. 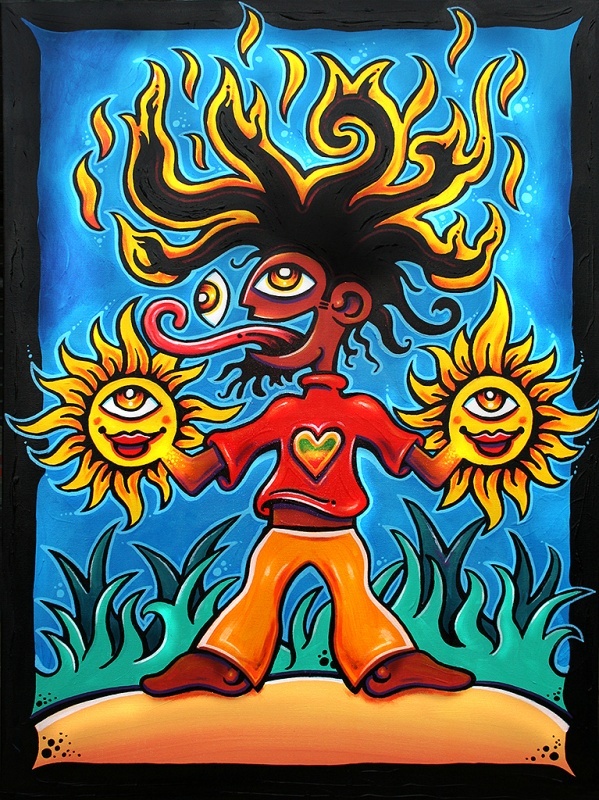 Dennis has the Rasta colors red, yellow and green used in the painting. It has also the famous "Dennis little Sun" present. Life’s ups and downs. What Dennis is concerned the life of the highest peak in the deepest valley of cases, from which he has risen again, which he successfully completed. He’s a fighter. It was time for a new cloth and the inspiration for this was to him spontaneously donated by a woman. Or he could paint something with the title: Step by Step. "Step by step, Dennis." As usual, there was an immediate image in Dennis’s mind. A figure in an ongoing upward kick in an uncertain future; a fog cloud. Looking back to a bush, a painful past. In using a backpack with emotions and memories of the past. A tear, a laugh, a divided heart and the key to a door to the future, to be opened by himself and enter. There was a time when Dennis, the situation at the time, smoked one cigarette after another. At one point he came into contact with a woman, her name was Marieke. Marieke began to call Dennis "Mr. Chimney", or "Mr. Smokestack". Dennis, always searching subjects for paintings could not leave indifferent the name and subject. Immediately there came another image in his head. A rebellious figure with a stoic look and burning lighter in hand. A smoking cigarette in his mouth with a chain to it, loaded with other burning butts. 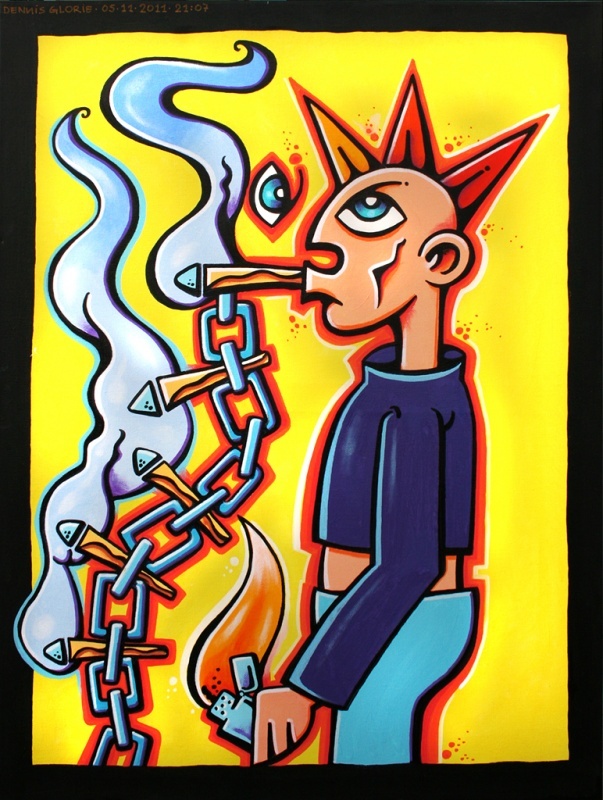 In the style of Dennis, the painted "chain smoker" on a hard yellow background, contrasting with the dark purple. The painting "Home Sweet Home?" Dennis created by the day he received the key of a new home. Therefore this title, but it is questionable whether the new property called "sweet" might be, hence the question mark after the name of the canvas. He says that the painting also symbolizes something else. 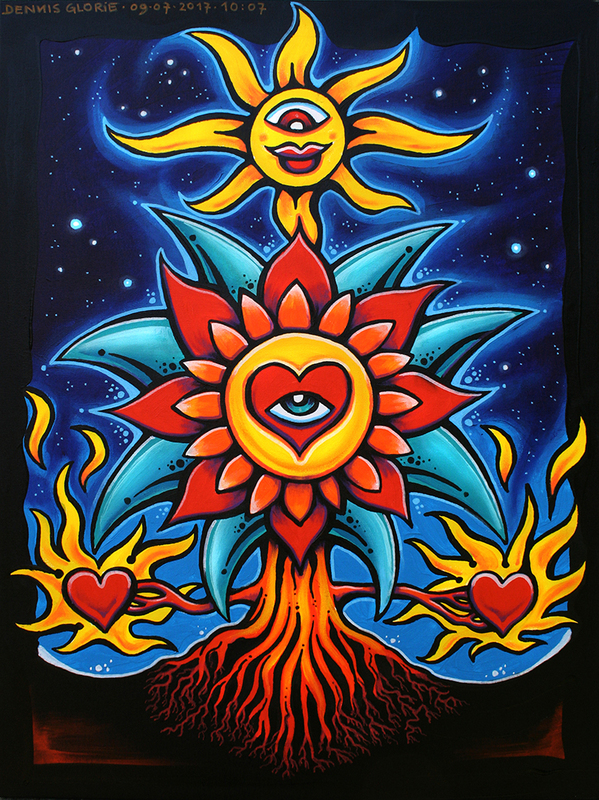 He points to the "golden heart" and the flames from the figure, these "enlightened" stares at the "Dennis sun." A particular pose, I would note, Dennis smiles. 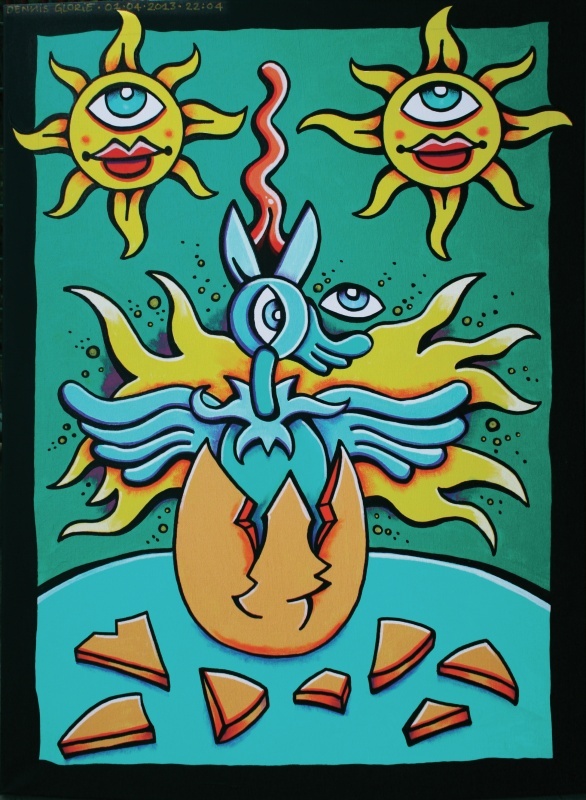 A painting by Dennis with two suns, there are immediately more questions to mind. He says he made this painting over Easter in 2013. Looking for a new idea, he spoke to a friend about this. Marijke smiled and said it was Easter. She asked if he could do something with the idea of a bird coming out of an egg in the world. Immediately there was an image in his mind and he started painting. Dennis thought about the symbolism of rebirth and so came "Extraordinary Easter" into the world. The title of this painting is "The Truth Shall Set You Free". Dennis explains in this canvas that is painted on a day that was a crucial decision for him by a higher authority. The result of the decision of these higher power gave him at that time the freedom he fought for. the right triumphed and Dennis explains that the truth from a good heart, as according to him, always wins. Many think it is "the all seeing eye" logo which was devised by a group calling itself the Illuminati . This is absolutely not true , they use it only as a logo for their order. The symbol has actually been around for much longer and shows up on very old gravestones and churches. It is therefore a contact with a much "higher" enlightment or divine influence. In presenting this painting Dennis looks frowning at the ground. He says that this work is about the most powerful emotion; pure grief, pain and loss. He wants nothing to say about this piece of art, except that the person in the middle represents himself with a son on each side. This cloth he used a powerful orange contrasted with the cyan blue as contrasting colour. A clear image with sharp contrasts, the whole again pops. The day he accomplished this painting was a painful day for Dennis, he wished therefore pretty much nothing to say about this piece. It’s all about emotion he said. 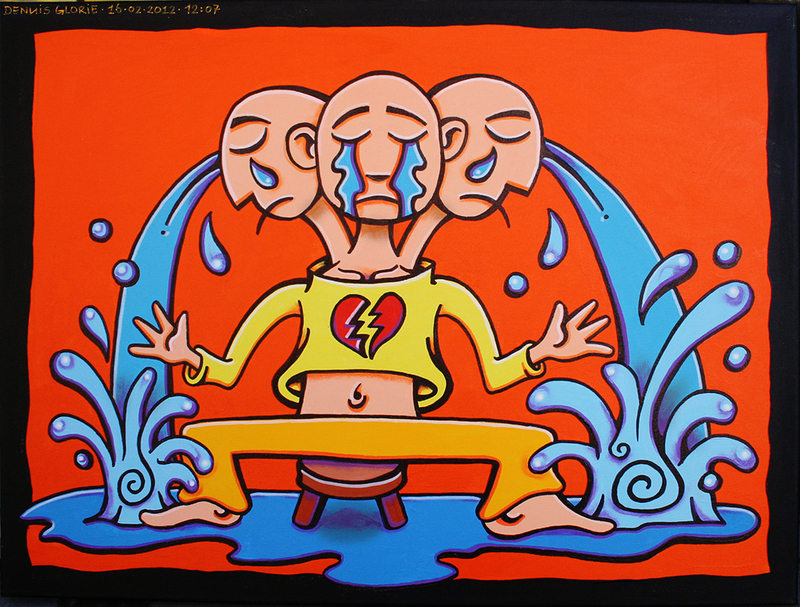 Many paintings by Dennis go over emotion in strong colors, but this one is different. This picture shows pain, nausea and grief. A broken heart. 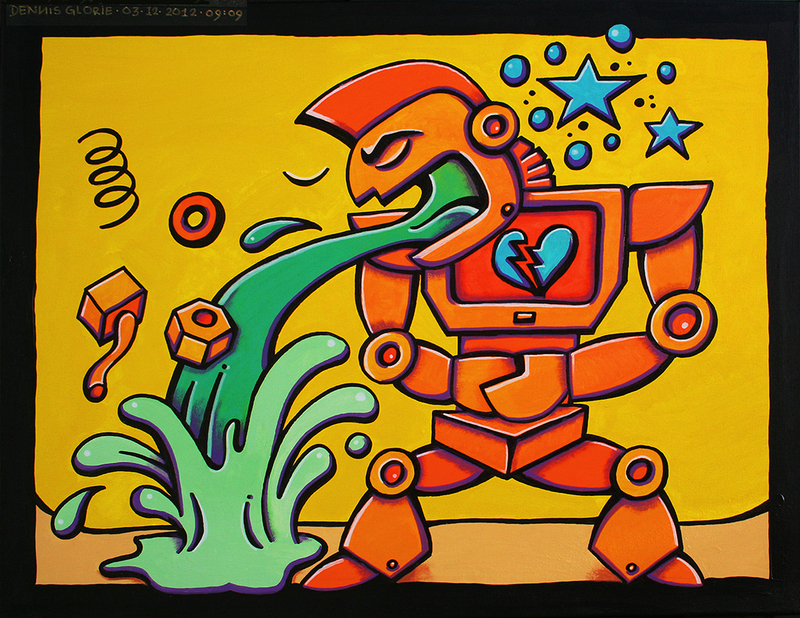 The robot vomits out its own parts and it gives him more pain. Dennis remembers that day all too well. He was silent as he shows the painting and said only one sentence. ’betrayal, the most dark fact in the world. " One evening, Dennis had seen a movie. Besides music, a favorite activity for inspiration to paint. He took the title of the film so catchy that he alone with that title gave a twist to this newly created painting. 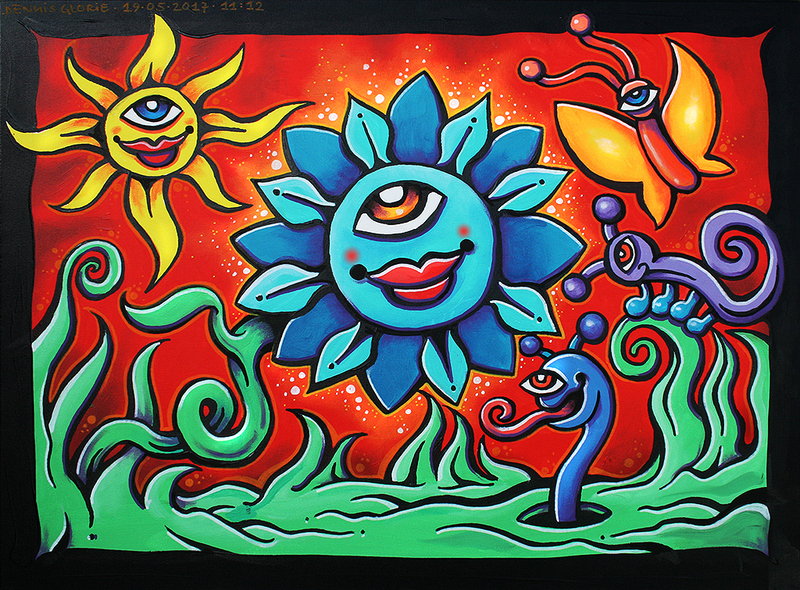 The famous "Dennis sun" in this painting is depicted larger than usual, this time with the iris of the eye downwards, though. 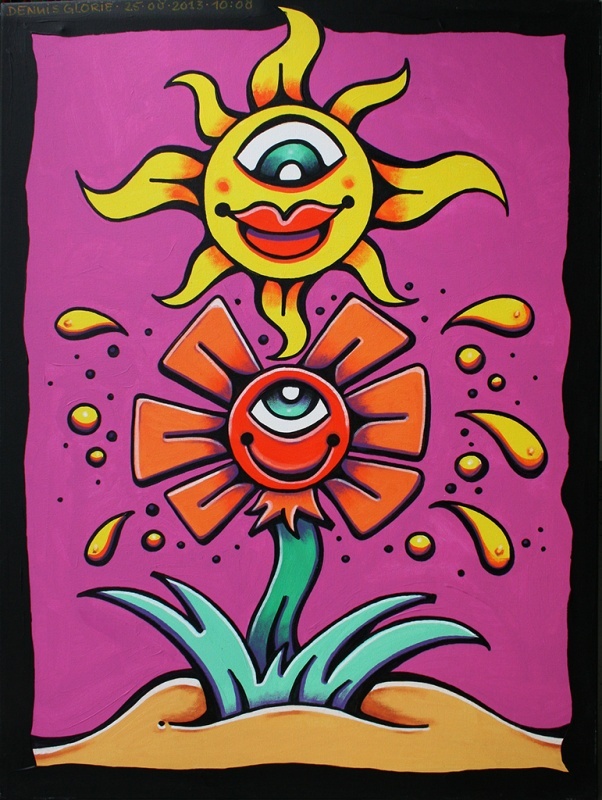 The Fantasy flower receives warm sunshine and is in full bloom. Outside the sun was shining on this special day for Dennis. The painting "The Dictator" is about people who are increasingly becoming more like robots by current technology. Electronics and technology are increasingly being more implemented in the human body. We want to "control" over all things in life. Dennis thought this was a nice concept to make a canvas. The background is in hard red tint. As a result, the blue metallic objects are in high contrast. The figure has everything under control and gives directions. As Dennis depicts each year on the anniversary of his son a painting for him. He explains that the painting is about pure love. The infinite love of the father for his son. 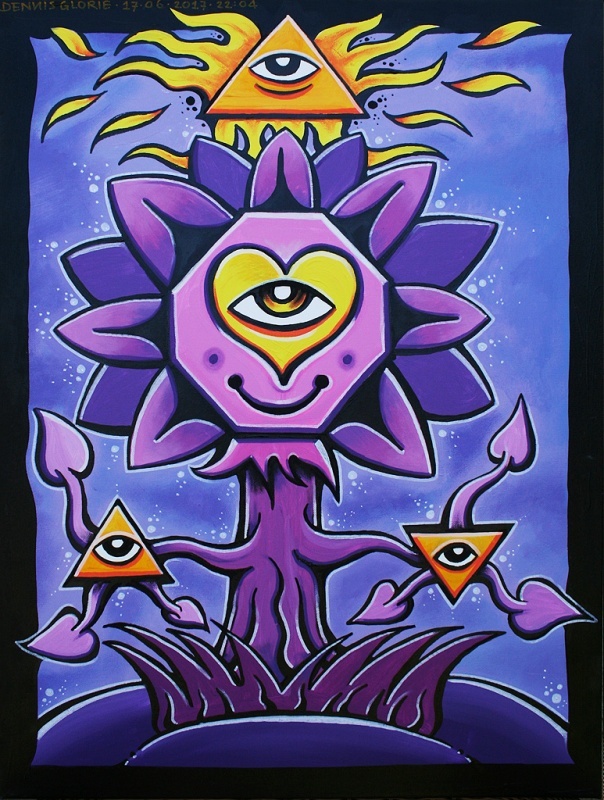 So Dennis says that this painting "father flower" over the "flower child" mercy. Unconditional love portrays this cloth. We also see a butterfly drawn in popping pink hue. 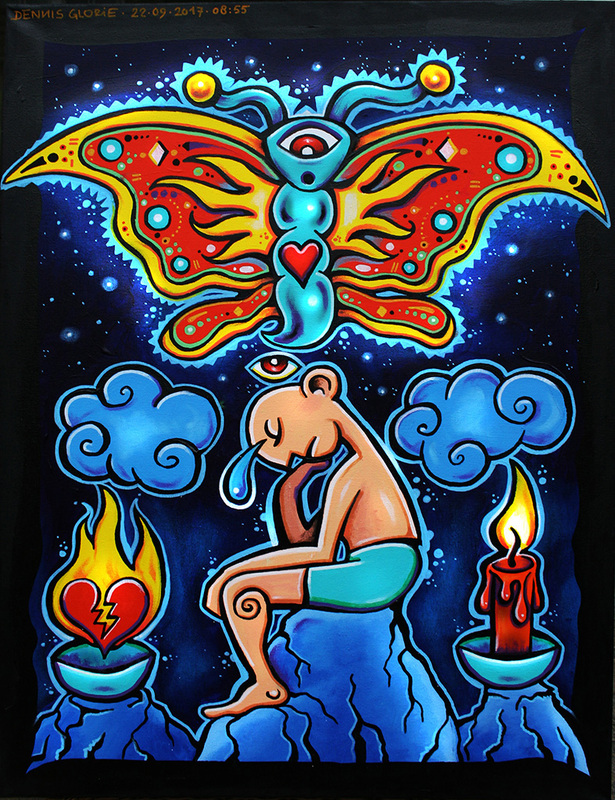 According to Dennis, the butterfly symbolizes the fragility and transience of life. The metamorphosis of all that is in the universe, but also a transformation, because energy never dies. Again, the famous "Dennis Sun" present, the painting looks warm. Dennis was again looking for inspiration when a friend lit a cigarette and blew smoke. Carlos felt sad and listened to music from a cartoon called "colours of the wind". As he often felt better by this. Upon seeing the gloomy Carlos and hearing the sensitive track Dennis thought of "blue wind blowing through the mind of a man." At that moment Samaneh walked in, an Iranian beauty. The result has been this painting. The model Samaneh with her beautiful, black and wavy hair, which moved a blue wind power. The blue blasts with contrasting bright red background. 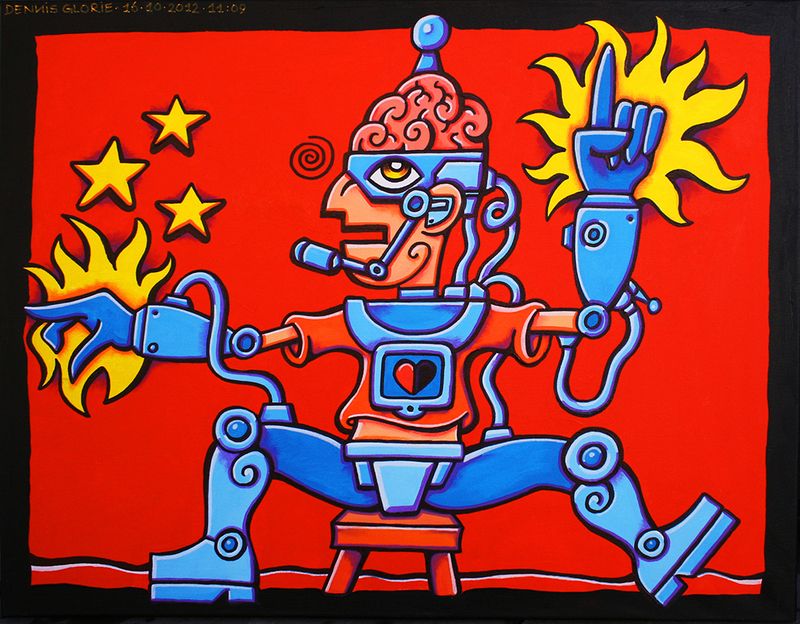 One day Dennis for each of his two sons decided to paint a robot and called it the "Matrix" or - as the ancient alchemists called it - "Metatrons Cube". This work is the second from the series "Metatron", Metatron - B". In total there are three different "Metatron paintings" made. Inspired by Valentine Dennis made this painting. That’s the way, constantly and at any time of the day looking for new ideas. 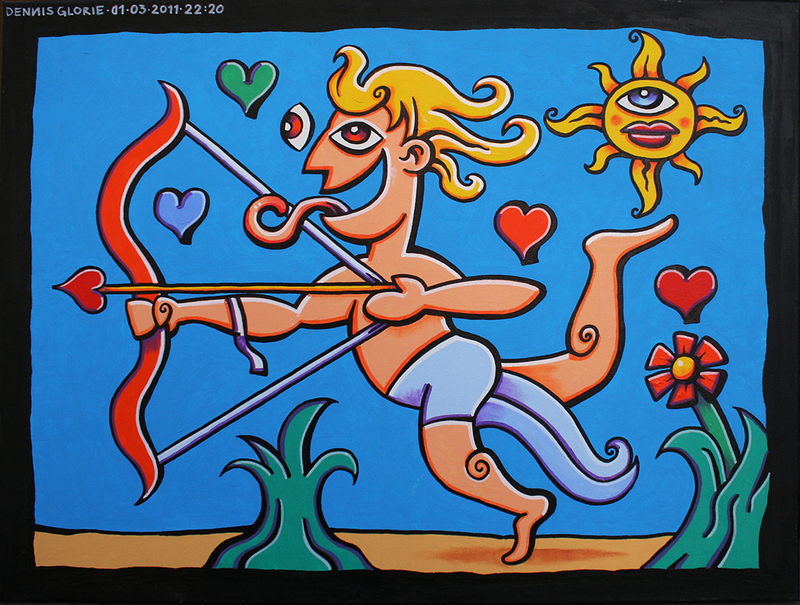 Cupid surrounded by multicolored hearts, strained his bow and with a smile he aimed his arrow. I immediately notice that even the arrowhead consists of a heart. The characteristic "Dennis sun" here is also present in the clear blue sky. Big brother is watching you! This painting has to Dennis again, by his way to enforce a certain awareness. Awareness of the fact how "Big Brother" or the government, increasing controls the life of a human being. We lose privacy and data retrieved by anyone using the internet by simply pressing a button and as Dennis says with a grin, throughout its controlling circus. 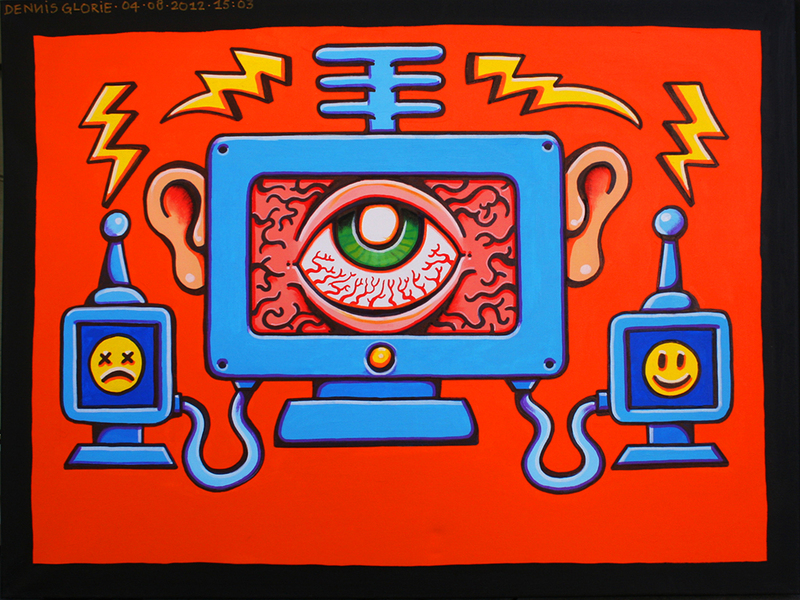 The painting is tight; a dominating all-knowing and all-seeing computer that observes the people and even controls the emotions. It is performed in a hard orange shade with a contrasting blue. 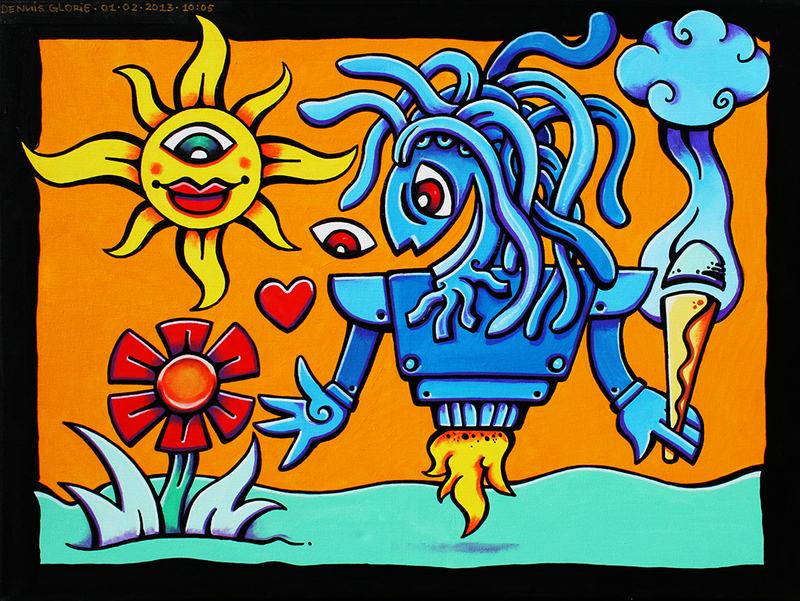 A Rasta robot with dreadlocks and a thick Ganja joint in his hand admiring a flower. 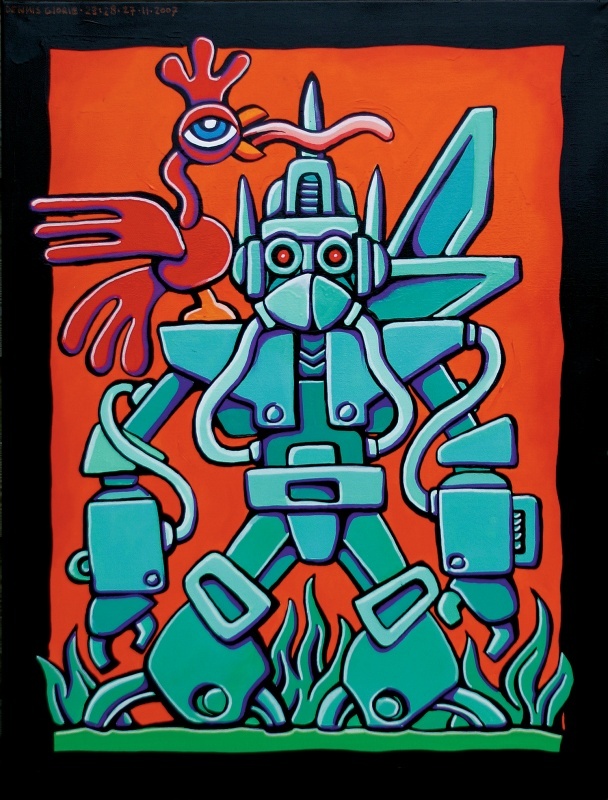 A robot that shows love for nature, that’s the concept of this painting. On a dark yellow background, the metallic blue emerges strongly. The "Dennis sun" is again present.